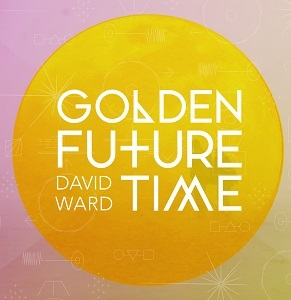 'Golden Future Time' is the new album from David Ward. Well I say "album" but it's more like two EP's in reality. It's split into two parts - side A and B (clearly going for the retro vinyl feel), and the two parts were recorded at different studios, so it does seem more like 2 EP's released on one disc rather than a proper album as such. The 2 EP impression is further reinforced by the short length of the release - seven songs and just 27 minutes long which is very short. If you're slayer and are releasing an album of ten brutally fast songs then 27 minutes is just about ok for an album length but with music like this it just feels too short. One you start to listen to the album then it really does reinforce the feeling that this is two separate EPs on one disc. The first half is more guitar driven while the second half is synths and keyboards. The vocals are very good throughout, and display a range of styles over the course of the album. Of the two parts of the album I definitely prefer the first, with "Lost" being a particularly good track. An interesting release but I think it would have worked better as two EPs.